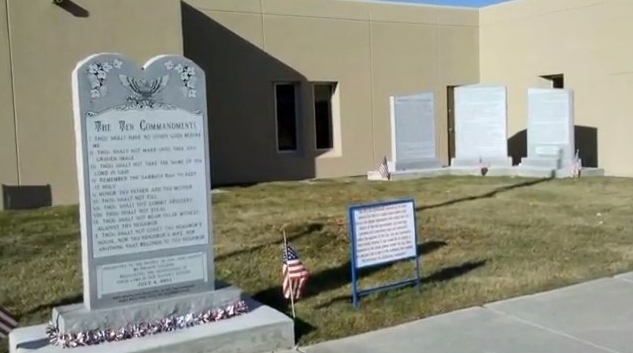 BLOOMFIELD, N.M. — Officials in a New Mexico city are considering their next steps to defend a Ten Commandments monument placed on the grounds of city hall after the 10th Circuit Court of Appeals denied this week a request for a full court review of a three-judge panel’s ruling against the Decalogue display. “Americans shouldn’t be forced to censor or whitewash religion’s role in history simply to appease the emotional response of two offended individuals with a political agenda,” said Alliance Defending Freedom (ADF) Senior Counsel Jonathan Scruggs, which represented the City of Bloomfield in court. As previously reported, the monument at issue had been erected in 2011 following a resolution allowing private citizens to place historical displays at Bloomfield City Hall. A former city council member had proposed the monument four years prior, which was then approved by city council but paid for with private money. “Presented to the people of San Juan County by private citizens recognizing the significance of these laws on our nation’s history,” the monument read, which was unveiled during a special ceremony on Independence Day 2011. But Wiccans Jane Felix and Buford Coone of the Order of the Cauldron of the Sage felt offended by the monument and contacted the American Civil Liberties Union (ACLU) for assistance. “Our clients who are not Christians, they took issue with this and it made them feel alienated from their community,” Alexandra Smith, legal director for the American Civil Liberties Union (ACLU) of New Mexico, told local television station KRQE. The organization filed a lawsuit against the city in 2012, asserting that the monument’s presence on government property amounts to the government endorsement of religion. While the city argued before the court that the monument was historical in nature, the ACLU contended that the content of the Commandments themselves is blatantly religious. “One of the commandments is thou shalt put no gods before me. This is clearly not a historical document, but is in fact religious doctrine,” Smith stated. In August 2014, U.S. District Judge James Parker, nominated to the bench by then-President Ronald Reagan, sided with the Wiccans, declaring that the Decalogue violated the First Amendment to the U.S. Constitution. “In view of the circumstances surrounding the context, history, and purpose of the Ten Commandments monument, it is clear that the City of Bloomfield has violated the Establishment Clause because its conduct in authorizing the continued display of the monument on City property has had the primary or principal effect of endorsing religion,” he wrote. The city appealed, and in November, the 10th Circuit upheld Parker’s ruling, stating that the addition of historical monuments adjacent to the Ten Commandments did not fix the constitutional infirmities. “[I]t was especially inadequate here because of the plain religious motivations apparent from the approval (approved alone), financing (sponsored entirely by churches), and unveiling (ceremony rife with Christian allusions) of the Monument,” the three-judge panel wrote. The city then sought an en banc, or full appeals court, review of the case, but on Monday, the request was denied. However, Judge Paul Kelly, Jr. and Chief Judge Timothy Tymkovich dissented, opining that their colleagues incorrectly concluded that the monument violated the Constitution. “From the words of the text, though, two conclusions are relatively clear: first, the provision originally limited the federal government and not the states, many of which continued to support established churches; and second, the limitation respected only an actual ‘establishment of religion,'” Kelly explained. City Manager Eric Strahl told local television station KRQE that city council will likely meet next week over the matter. The case could head to the U.S. Supreme Court.